"Addio del passato" is the final aria of the dying courtesan, Violetta, in Verdi's La Traviata. The title means "farewell to the past." The tragic and beautiful Muzio died one year after this recording was made. The depth and sensitivity of her interpretation of Violetta has never been matched (IMHO). 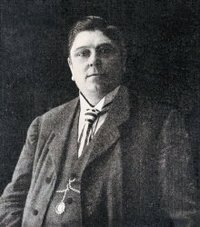 Alessandro Moreschi (1854-1922) was a famous castrato and "the only [one] of the classic bel canto tradition to make solo sound recording." It is not known whether he was castrated for medical reasons (as a cure for inguinal hernia) or to preserve his boy soprano vocal range. Either way, the result was the same: he remained a soprano throughout his life. Most of Moreschi's recordings are mediocre-to-awful -- for one thing, early recording techniques were extremely unflattering to the soprano range. However, there are some exceptions. I think his 1902 performance of Paolo Tosti's Preghiera recorded at the Sistine Chapel in Rome, is quite lovely, particularly if you allow for the sound technology available in 1902. It certainly offers a rare opportunity to hear a unique sound from our cultural past -- a soprano register produced by a full-grown male body sounds like nothing else in the world (even the stunning adult male soprano Michael Maniaci). Also, here's a female lyric soprano for comparison. [Maniaci] does not sing falsetto, nor does he have a baritone register, as counter-tenors do. On the other hand, he is whole and male (he obviously shaves; he assures me he is fertile). It is just that some quirk in his development led to all the appurtenances of puberty appearing except one – his larynx did not grow along with the rest of him. As a consequence, his voice never broke. . . . He may be the only man on the planet who can sing [the role of Atis in Reinhart Keiser's 1711 opera The Fortunes of King Croesus] at pitch, which goes up to a B natural, two octaves above middle C. Maniaci’s speaking voice is light and high, but, because he is an adult with a stocky frame, it is oddly resonant, like a rather fruity maiden aunt. His singing voice probably comes close to those castrati voices of long ago – although with only one antique recording available we can only really guess. Here's Maniaci's performance of the full Mozart Alleluia uninterrupted by commentary. Also, here are soprano Lucia Popp and countertenor Andreas Scholl (below)for comparison. Check out these intriguing close-ups at Geology.com. Scribal points for new variations. Shakespearean puns and the Great Vowel Shift discussed and illustrated here.